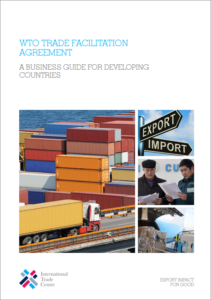 This guide, published by the International Trade Centre, is designed to help businesses in developing countries take advantage of the World Trade Organization’s Trade Facilitation Agreement (TFA). Neither governments nor the private sector can implement the Trade Facilitation Agreement alone. The involvement of the private sector in effective trade facilitation is essential. After all, it is businesses who know best where the barriers to trade lie. This guide provides jargon-free explanations of the TFA’s provisions with a focus on what businesses need to know in order to take advantage of the agreement and how they can get involved in shaping reforms.